I found this recipe in my late Mom�s recipe box. It was cut out of a newspaper�.very old and yellowed. I wish it would have had a date, I bet it was from the depression (the one in 1929) or maybe even earlier. It was so fragile I was almost afraid to pick it up. Reading the ingredients, I was intrigued. A pie with only 3 ingredients? I had to try it! 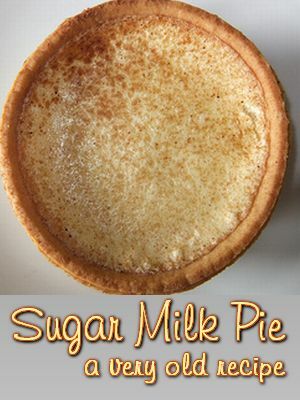 It is similar to a custard pie, but not as heavy. I usually put cinnamon and a pinch of nutmeg in mine, though I have made it with coconut, which is delicious! It really is versatile, you can even make a chocolate version by adding cocoa powder and chocolate chips sprinkled on top. My husband�s favorite is orange, I just put a few drops of orange extract in the filling and zest some orange peel on top.